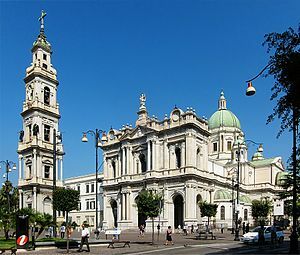 On October 10, 2004, Bishop Carlo Liberati, Pontifical Delegate to the Shrine of the Blessed Virgin of the Holy Rosary in Pompei, Italy established ‘a most fervent and fraternal link of communion’ between The Shrine of Our Lady of Pompeii, Chicago and The Shrine of the Blessed Virgin of the Holy Rosary, Pompei, Italy. Please click here to read the letter from Bishop Carlo Liberati, to Francis Cardinal George, Archbishop of Chicago. A framed copy of this letter is proudly displayed to the right of the inside center doors as you exit the Shrine. Click below to link to the Pontifical Shrine of the Blessed Virgin of the Holy Rosary, in Pompei, Italy.